B'nai B'rith was founded in New York City in 1843. Its first Cleveland Lodge was started here in 1853, with Simpson Thorman as president. It is, according to the Encyclopedia of Cleveland History, our city's oldest service organization. 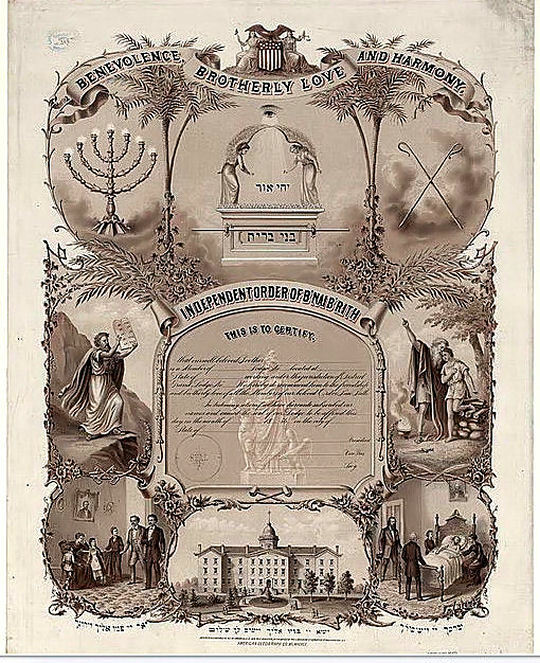 A Library of Congress exhibit "From Haven to Home" included this 1876 certificate of membership in B'nai B'rith. The building shown at the bottom of the certificate is the orphanage they established in Cleveland in 1868. In 1912 the three Cleveland B'nai B'rith lodges - Solomon #16, Montefiore #54 and Baron de Hirsch #454 - merged and acquired the building, constructed in 1907 as Pythian Hall. The organization served an important purpose, bringing together active and involved Jewish men to address issues of Jewish concern. In the early 1940's, with all its members living far to the east, in Glenville, Mount Pleasant or the Heights, the B'nai B'rith left the building. In 1954 the Prince Hall Masons bought it. The building occupies a place in Cleveland Jewish history for it was there on Sunday February 24, 1917 that Abba Hillel Silver, only 24 and in his first pulpit in Wheeling West Virginia, spoke. Alfred Benesch, then a trustee of The Temple, was active in B'nai B'rith regional affairs where he had met Rabbi Silver, also an active member. Benesch may have invited Silver to come to Cleveland. As Benjamin Lowenstein, president of The Temple, would later tell Rabbi Silver, all the trustees had attended and knew immediately that they had found their new rabbi. 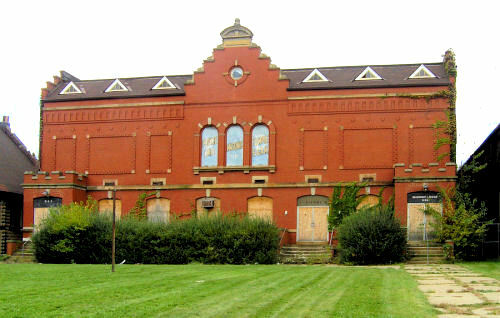 In the early 1940's, its members having moved to Glenville and the "Heights, B'nai B'rith no longer used the building. It was acquired by the Prince Hall (African American) Masons and lost in a fire in 2010. More on the loss of this landmark. If you can add to the history of B'nai B'rith in Cleveland, please contact us.